See how well you pay off debt, put money away for retirement and manage your investments in this fun financial game that let’s you experience 35 years in turbo speed. Test your money management skills by answering financial questions that allow you to move down the field and score touchdowns. Are you warmed up and ready to compete? 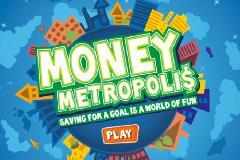 Money Metropolis allows kids ages 7–12 to navigate a multi-dimensional world, making life decisions that will affect whether their virtual bank account shrinks or grows. 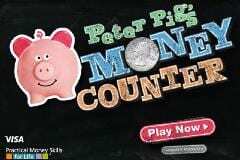 Recommended for children ages 4-6, Peter Pig’s Money Counter helps kids count and sort coins.